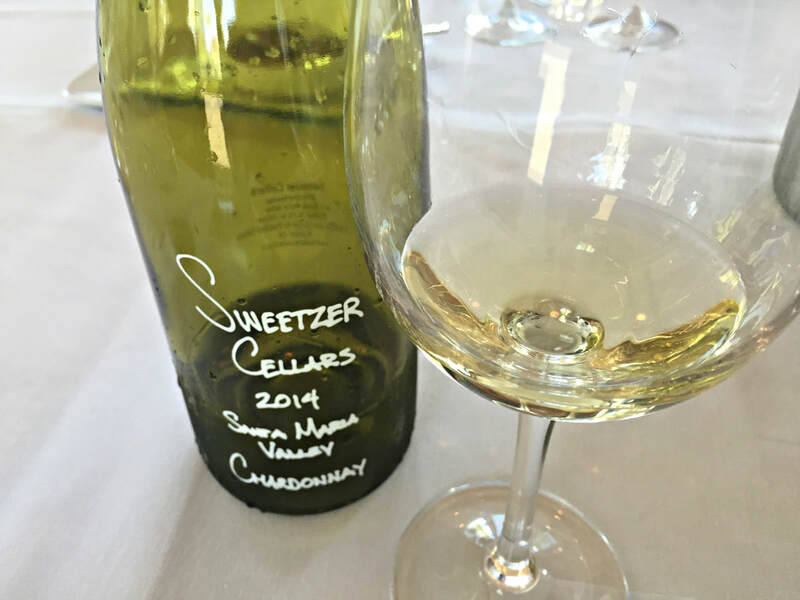 Sweetzer Cellars, distinctive and well-priced wines, mostly single vineyard Chardonnay and Pinot Noir from some of the best vineyards in Santa Barbara County, began in an unconventional way, very different from most wineries. A twist of fate led a couple, tutors by trade, to make wine, with no experience, out of their Hollywood apartment. This ultimate garagiste experience provided the launching pad for the next step, a commercial winery in one of the most exciting wine regions in the US, Santa Barbara County. Living the dream, Sweetzer Cellars has an unique story, one of trial and error, hard work and a bit of luck, and a love of wine that can't be denied. Serendipity seems to have guided the fates of Michael Fogelman and Lisa Liberati of Sweetzer Cellars. A last minute decision by Fogelman to join his girlfriend, Lisa, on a group winemaking trip to France in 2008 changed their lives. Particularly impressed with his visit to Burgundy’s Clos Vougeot, Fogelman marveled how passionate and dedicated the winemakers were, and how important the details were, such as meticulous harvesting and winemaking cleanliness. Upon his return, Fogelman announced his desire to make wine, telling Liberati “it seems like fun”. So, with no official plan, but a connection with one of the graduate students from his month in France, who happened to work at Stag’s Leap in Napa Valley, led to a source of Cabernet Sauvignon grapes. So the grand experiment began, with lots of drama and learning along the way. The first two years, Fogelman and Liberati hauled the grapes down from Napa in their van, arriving at their Hollywood apartment in time to start the winemaking process. He recalled, “We were living in a white carpeted apartment, and we hauled up 750 pounds of grapes. We pressed it in our tiny kitchen, with a basket press, and every time anything touched the wine, we rinsed it in a solvent solution, it took us from 7:30 at night to 3:30 in the morning to press what now would take us a half hour.” The third year, Fogelman invested in better equipment and brought more grapes from Sonoma. Together, they pressed grapes in the carport, fermented in large macrobins in their dining room, and gerry-rigged a cooling system for their barrels in their apartment, which had no a/c at the time, gaining invaluable knowledge and expertise along the way, and eventually an air conditioner! One lesson of home garagiste winemaking, when working with argon gas to pump wine from barrels to kegs, there are some caveats. Fogelman can chuckle now, as he remembered spraying their bedroom with wine, after disconnecting the tubing from the keg before relieving the pressure in the barrels, which resulted in a massive cleanup. In the fourth year, Fogelman and Liberati switched from Cabernet to Pinot Noir, their first love. Researching the vineyards of the Central Coast, they knew they wanted to make wines that they loved to drink, and forged a relationship with Presqu’ile Vineyard, which eventually led to getting fruit from some of the best sites in the region, La Encantada, Rita’s Crown, Lafond, and Huber. After two more years of producing wine in their apartment, they decided to become official and go commercial, legally morphing into a bonded winery five years into their enterprise. Now making wine in Buellton, but still living in Hollywood, both continue their day jobs, as tutors that prep students for college tests, alongside growing Sweetzer Cellars on their own dime. 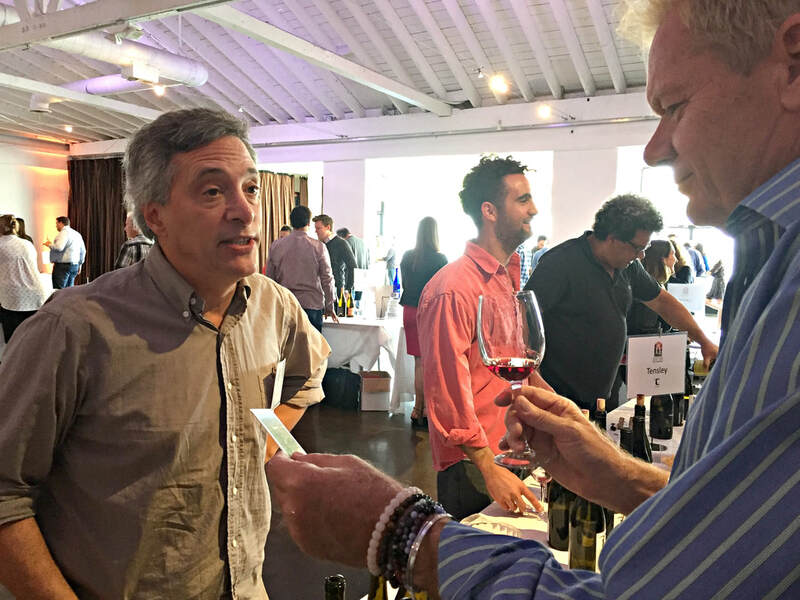 Gaining recognition and awards for their lineup of almost a dozen wines today, Sweetzer has increased production but still sells directly to the consumer, mainly through their website, but some wines are available in restaurants and wine shops around Los Angeles. Fogelman and Liberati want to stay hands-on, a smaller operation that can pursue the type of wine that they are passionate about. Hand-written wine labels, now screened onto the bottles, proudly pay tribute to their winemaking origins, their Sweetzer Ave apartment. In addition to six Pinots and two Chardonnays, they also dabble in Paso Robles Syrah and Grenache. A benefit to their independence is that they can release the wines later, allowing them to more fully evolve in the bottle and be ready to drink when uncorked. Fogelman and Liberati are working hard to get the word out, pouring Sweetzer wines at wine festivals and trade tastings, and getting set to add a tasting room, located in the Lompoc Wine Ghetto, 308 N. 9th Street Unit C, which will be open to the public, Friday - Sunday, 11am - 5pm, and other days by appointment. 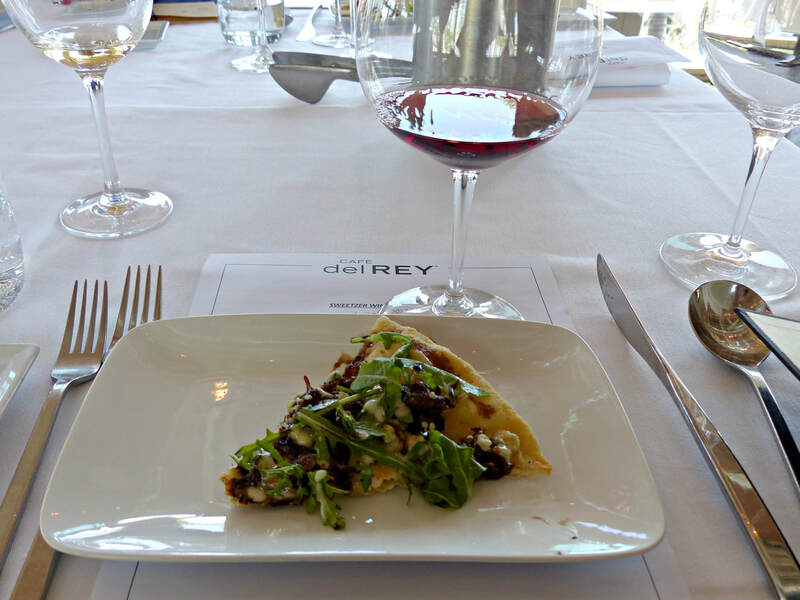 Recently, Michael Fogelman shared his wines and story with the LA Wine Writers, over lunch at Cafe del Rey, paired with Chef David Vilchez’s creations. 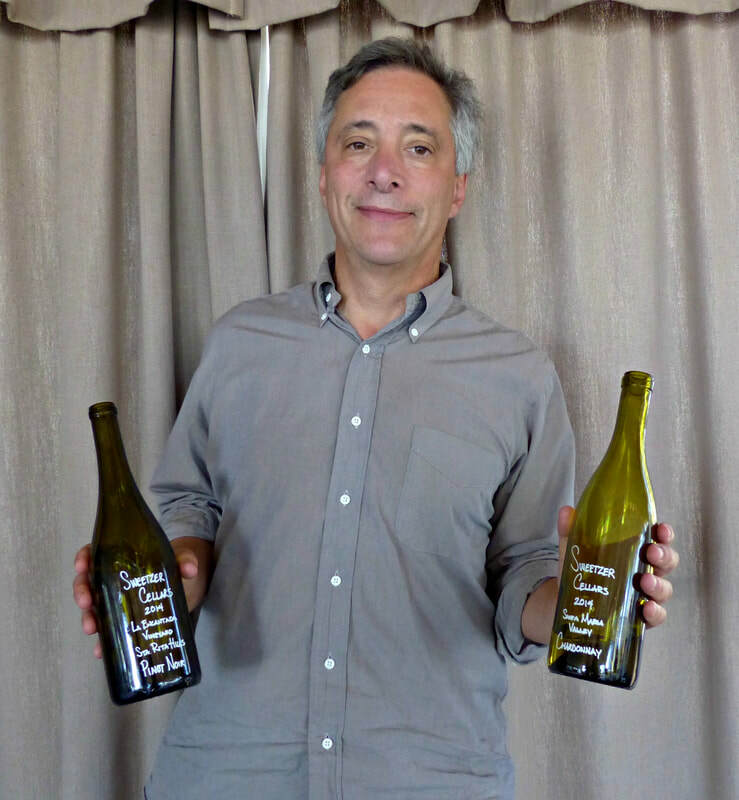 Over an introductory glass of Chardonnay, Fogelman recalled his almost decade long journey as the accidental winemaker, and shared his enthusiasm for Sweetzer Cellars' bright future. 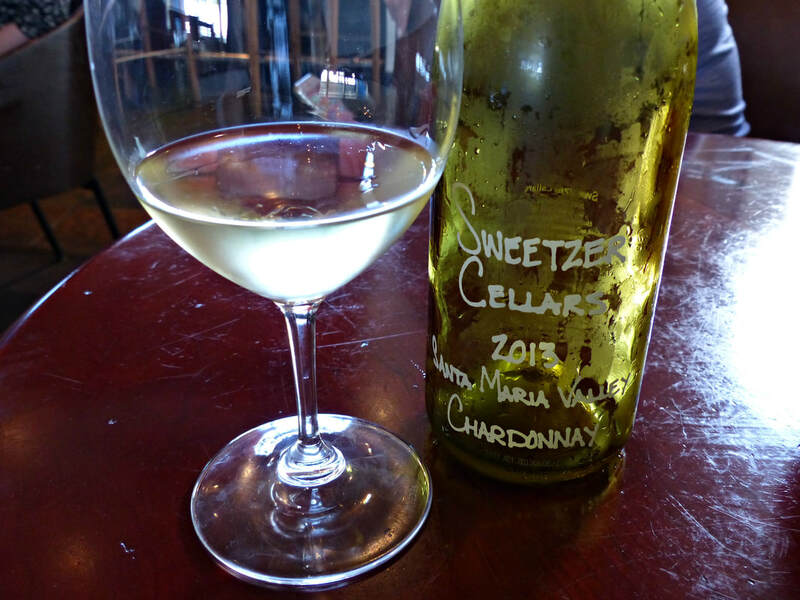 The 2013 Sweetzer Cellars Santa Maria Valley Chardonnay ($25) is a reflection of high quality fruit, of which four different Chardonnay clones are blended. Vibrant and mineral, ripe tropical fruit, apple, and Meyer lemon, with toasty accents, and a butterscotch note shine from the glass. The 2013 is slightly different, since an unintentional winery accident forced Fogelman to deviate from 100% tank fermentation, ending up with 15% new oak barrels. 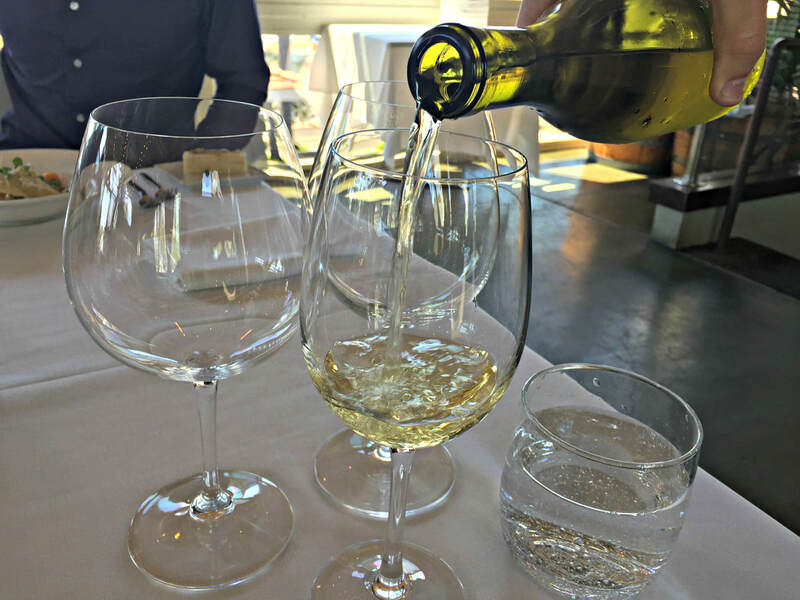 First course, the 2014 Sweetzer Cellars Presqu’ile Vineyard Santa Maria Valley Chardonnay ($40), made from the best of the best, is rich and balanced, with a similar mineral acidity and flavor profile, but a bit more elegant. Paired with a fabulous Blue Crab Pasta, paccheri pasta with Peas and Tomato, in a Parmesan Sauce, the wine was bright and delicious, with a depth of flavor. Second course, the 2013 Sweetzer Cellars Lafond Vineyard Pinot Noir Sta. Rita Hills ($30) has a beautiful nose, with ripe red cherry fruit, and upon the first sip, it blooms in your mouth. This is a blend of Clones 115 and 667, aged in 30% new barrels for 14 months, a very good wine. Full-bodied and rich, and structured with a mineral spine, it lingers long after the last swallow, really great. Paired with an Oxtail Flatbread, with Arugula, Bleu Cheese, and Lemon Vinaigrette, the wine was sturdy enough to stand up to the bold flavors, but silky and round, a true delight! Third course, the 2014 Sweetzer Cellars La Encantada Vineyard Pinot Noir Sta. Rita Hills ($45) is bold, with a nose of black cherry, raspberry and spice, and on the palate, it channels an earthy, crushed rock profile, and a long, velvety finish. 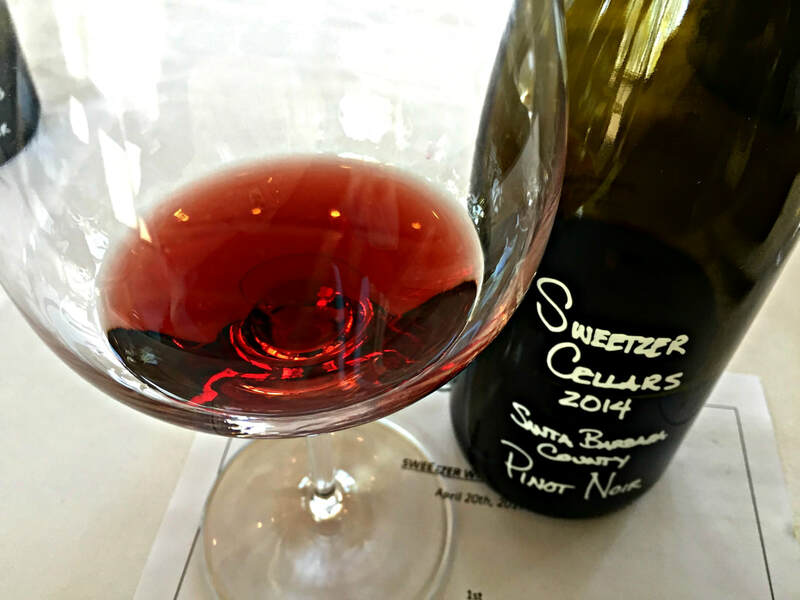 A second wine, the 2014 Sweetzer Cellars Santa Barbara County Pinot Noir ($33), is a blend of some of the best vineyards in the region, and offers a lighter, but complex profile of red and black fruit, with touches of earth and spice, this is one of Sweetzer’s workhorse blends, with over 500 cases produced. Paired with a Duck Breast with Beets and Berry Sauce, both wines’ deep flavors and dark cherry fruit complimented the dish. 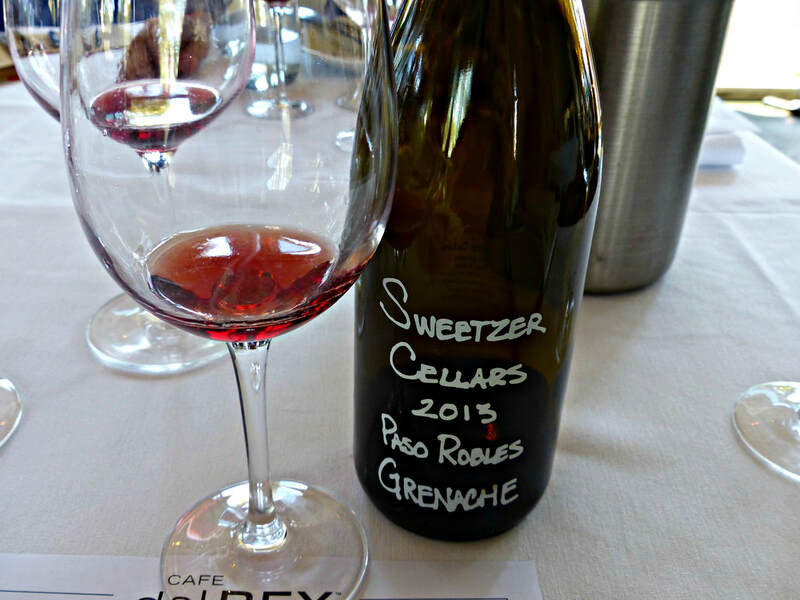 Fourth course, the 2013 Sweetzer Cellars Grenache Paso Robles ($30) is expressive, red-fruited and vibrant, and well balanced despite it’s high alcohol. 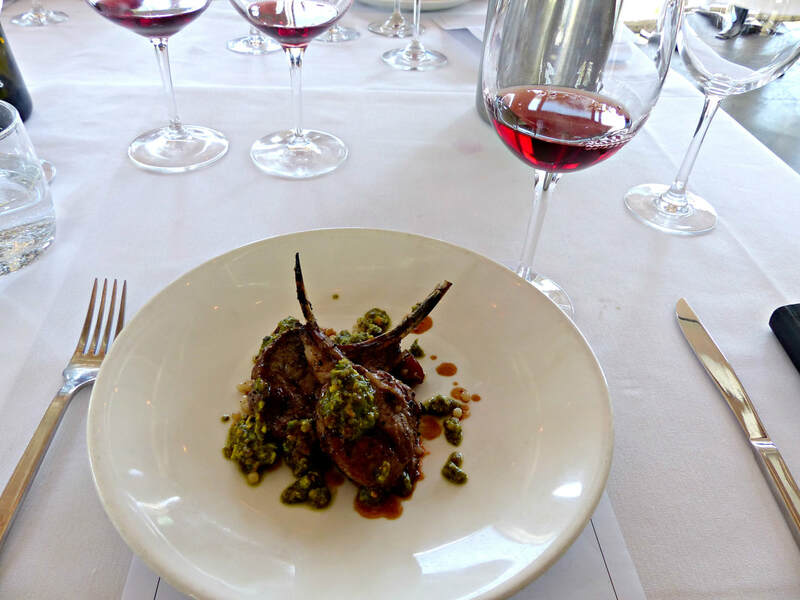 Paired, with a Lamb Chop, with Israeli Cous Cous, Dates, and a Pistachio Mint Pistou, the fruit really came out, but not a jammy wine, as Michael explained, “this is not like any Grenache you’ve ever had”, and it really delivered. 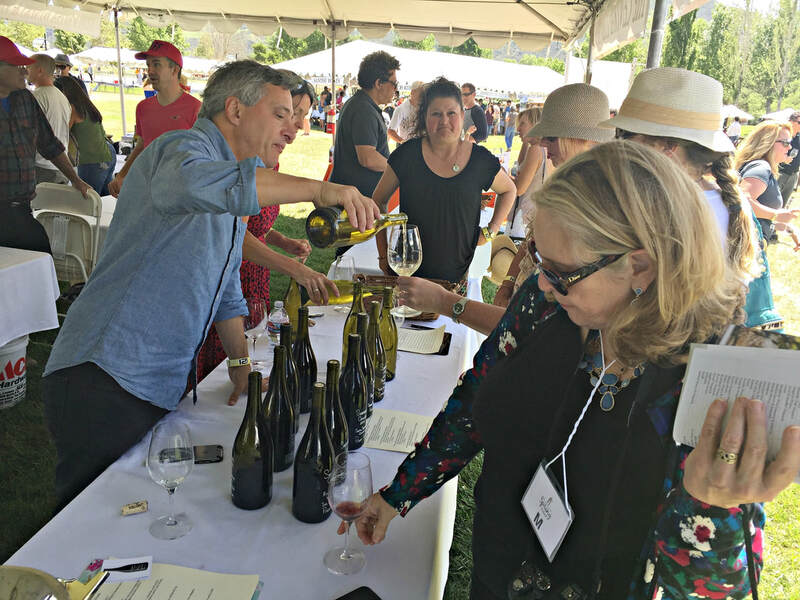 Later, that same week, Fogelman and Liberati poured six of their wines at the 2017 Santa Barbara Vintners Spring Weekend Grand Tasting, and attracted quite a crowd! They brought out a couple of different Pinots that were top notch. 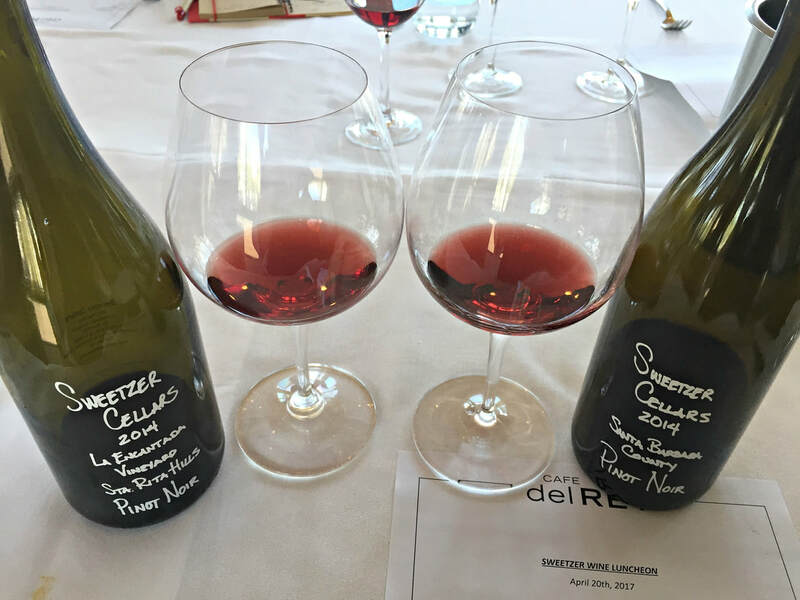 The 2014 Sweetzer Cellars Rita’s Crown Vineyard Pinot Noir Sta. Rita Hills is a real stunner, complex and high-toned, smooth and savory, with dark fruit and spice, along with the 2014 Sweetzer Cellars Presqu'ile Vineyard Pinot Noir Santa Maria Valley, an elegant beauty with dark cherry and what is known as Santa Maria spice, akin to an exotic Indian spice blend, and lower alcohol. 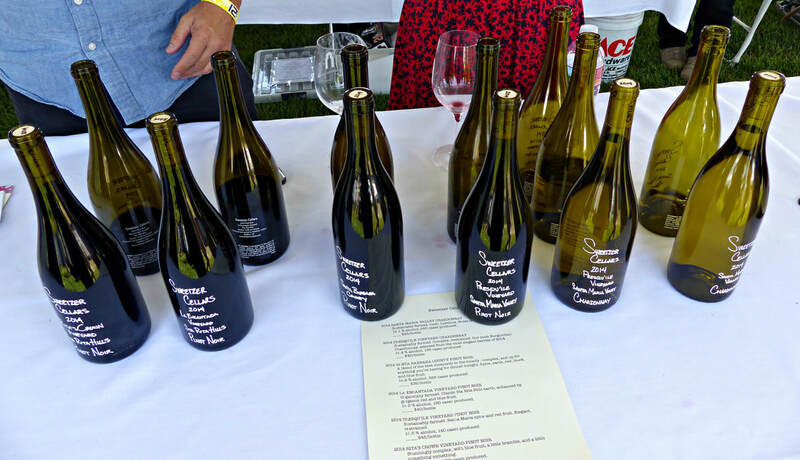 These wines rounded out an intriguing study of some of the best single vineyard Pinot Noir wines in the area, all very distinct, with their own personality. 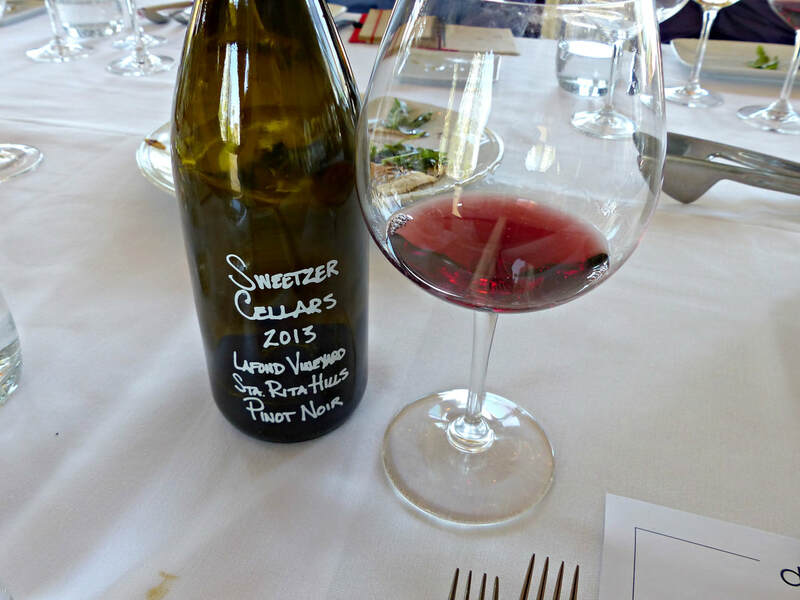 Sweetzer Cellars’ current vintage in release is the 2014, and the wines retail from $28-55, excellent quality for the price, essentially made from the same fruit as many higher-priced wines in the region. 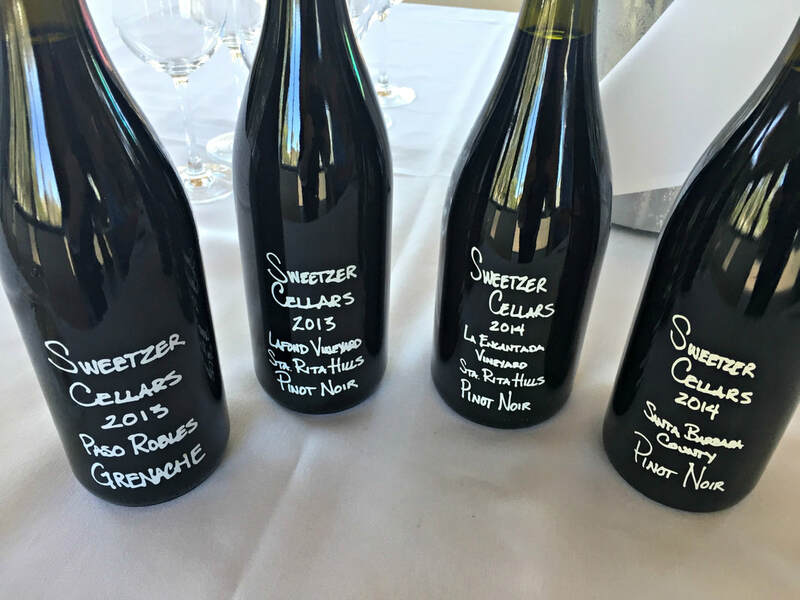 Sweetzer Cellars went from zero to sixty in a blink of an eye, self-taught winemakers whose passion and dedication are earning them recognition in a crowded field of wineries. Well-priced, distinctive and well-made wines, it is worthwhile to visit their new tasting room, and discover for yourself the magic in the bottle.